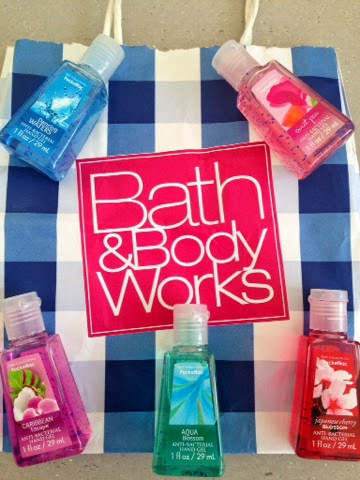 Bath and Body Works...America's best kept little secret and their answer to the UK's The Body Shop﻿. When I was flying and in and out of the states frequently, I would always make sure I paid a visit to this store, picking up little items for family and friends who always used to request the hand soaps, lotions etc. Recently, a 'flying' friend picked me up a few of these Bath and Body Works 'PocketBac' anti-bacterial hand gels, which are so great to just have in your bag. I always use them if I have been out on the London Underground all day, at work, after using the filling pumps at the petrol stations etc.. when my hands feel a little grubby and there's no place to wash them, these hand gels are perfect (however, you cannot beat good old fashioned soap and water!!). They all contain natural ingredients and powerful germ killers to keep hands fresh and there are lots of different fragrances to choose from. Unlike other hand sanitisers/gels which are on the market, that can be very drying due to the high alcohol content, these little gems also contain Tahitian Palm Oil which is surprisingly moisturising. They also have small little blue moisturising beads within the gel that I love, which pop and burst as you rub it into your hands. 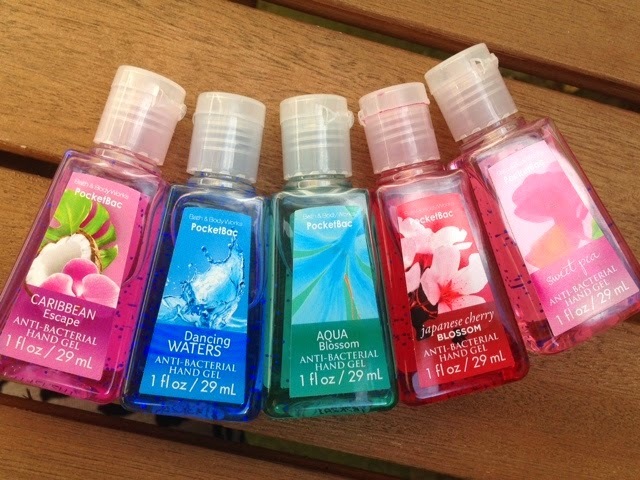 These hand sanitizers also have a really nice long lasting fragrance. My all time favourite and the one that I always used to buy back in the day is 'Sweet Pea' - described as a blend of juicy raspberries, pear and soft petals (above, far right). According to the Bath and Body Works website, America's favourite fragrance, is their very own 'Japanese Cherry Blossom'. This dark red PocketBac is described as having the scent of seductive blossoms from an exotic japanese garden (above, second from right). You can probably purchase these in the UK from Amazon or other mail order companies, however, expect to pay far more than they actually retail for in the states. These PocketBac's are currently 5 for $5 which is a bargain, as each 29ml bottle lasts for a very long time - You only need about a 5p sized amount for each application. I know the readers of this blog who are across the pond will be perhaps already familiar with these - as Bath and Body Works has expanded into Canada and also recently Kuwait, perhaps we won't have to wait too long in the UK before one pops up on these shores!